This fabulous cocktail shaker is probably American made by Hawkes Crystal. 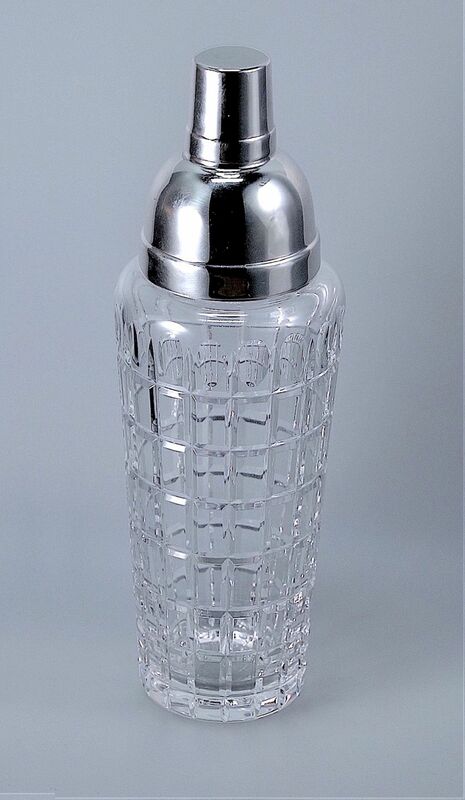 The base is made of crystal glass that has been deeply cut horizontally & vertically to form a series of rectangles with "finger print" indents around the top - the pattern is known as "Vernay" The shaker has a silver collar stamped "925" in an oval cartouche. A removable silver domed cap with an integral strainer fits over the collar and is stamped "Sterling". A silver cap fits onto the dome, it is gilded inside and the outside rim is stamped "925" in an oval cartouche. The top appears to double as a small "glass". "Vernay" was introduced in the 1920s as drinking glasses although auxiliary items such as cocktail shakers & pitchers & vases were also produced. Hawkes Crystal was established by Thomas Gibson Hawkes in Corning, New York in 1880. Thomas Hawkes was born in Ireland, emigrating to America when he was 17years old. Hawkes Crystal concentrated on imprinting deeply etched and intricately detailed designs into glass blanks purchased from other glass companies, most notably the Corning Glass Company . In 1903, Thomas Hawkes and Fredrick Carder established Steuben Glass Works to manufacture glass blanks so that Hawkes Crystal could control the quality of the glass that it used. Hawkes Crystal produced patterns of cut glass for two Presidents. In addition, two of Hawkes Crystal’s patterns were awarded a grand prize in the Paris Exposition. Hawkes Crystal produced monogrammed patterns as well as patterns of crests for their varied clients through the years. Many of the original Hawkes Crystal pieces do not bear marks, although some do so on the foot of the piece. The original Hawkes Crystal ceased operations in 1960. In 1964, the Tiffin Art Glass Company assumed the assets of Hawkes Crystal. Today, Crystal Traditions continues to manufacture the Hawkes Crystal line under the Hawkes Crystal mark.